Earlier this month we published our second Public Service Pledge, a set of commitments which we’ll report on annually, which aims to demonstrate our continued investment in our people, communities and the customers we serve. Two of the pledges we’ve made are around commitments to working with staff mutuals, SMEs and voluntary or community organisations in our supply chain. Currently over half of our core supply chain is with SMEs or social enterprises and we have committed to a value of £200m of our business value benefiting SMEs by 2025, representing an increase from 24% to 32% of our total spend. This is a commitment that certainly chimes with our university clients, most of whom have made similar pledges and are actively looking to engage more with SMEs, as well as with our young consumers, who increasingly want the companies and brands they buy from to act sustainably and ethically. We are making the Pledge commitment a reality in a number of ways. For several years we have run our Supply Chain Inclusion Programme, through which we engage with SMEs, social enterprises, ethnic minority or women-owned businesses, to help them with the knowledge to build commercial relationships with large organisations like Sodexo. The programme includes one-to-one mentoring and a day with Sodexo’s main food distributor, Brakes Group. Following the programme, participants have the opportunity to have their products or services successfully listed and incorporated into the Sodexo supply chain, as well as building the knowledge and insight to help them build their brand awareness and develop new commercial relationships. Within our universities’ supply chain we have developed a number of relationships with organisations who can help us bring in small businesses and brands. One such organisation is BLINK, a food service company who help us work with a number of pre-vetted small businesses and independent operators to offer a portfolio that is truly diverse and authentic. 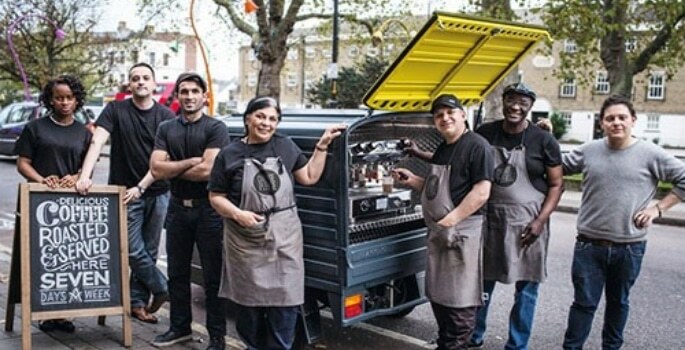 Across our London university contracts we have also teamed up with social enterprise Change Please, giving over the coffee cart in UCL’s main quad. Change Please is an organisation that helps tackle the issue of homelessness by empowering the homeless community to become baristas. It offers its employees full barista training, pays them London Living Wage as well as arranging housing, bank accounts and mental support. Finally, we are supporting our clients’ development bursary schemes to help students and graduates achieve their career and enterprise ambitions. At York St. John University we provide the Sodexo Business Start Up Fund, a bursary scheme through which students can receive seed funding and mentoring to progress their business idea. Students can also secure a Career Aspiration Bursary to remove the financial barriers to seeking internships and insight days or weeks. The scheme is particularly designed to support students in internships with local SMEs and charities, who wouldn’t necessarily have the funds to support traditional paid internships. An amazing 70% of students who have gone through the scheme go on to work for the organisation following their internship.